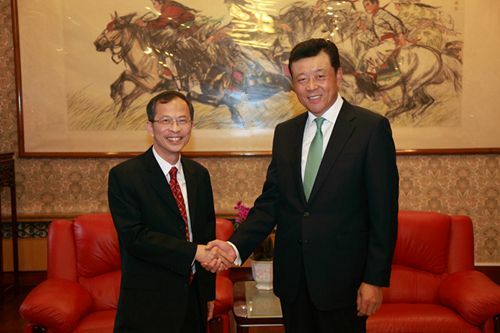 On 14 June, 2013, Ambassador Liu Xiaoming met with President Jasper Tsang of the Legislative Council of Hong Kong at the Embassy. Ambassador Liu recalled with pleasure the meeting with President Jasper Tsang in November 2011 during his visit to Hong Kong and welcomed him to head a delegation to visit the UK. Ambassador Liu introduced the current China-UK relations, noting that Hong Kong serves as an important bridge and link between China and the UK. The Chinese Embassy in the UK will continue to actively recommend Hong Kong to all circles in the UK, facilitate the exchanges and cooperation between Hong Kong and the UK in various fields and provide consular protection for Hong Kong compatriots in the UK. President Jasper Tsang said he was very pleased to meet Ambassador Liu once again, and expressed his gratitude towards what the Chinese Embassy has done over time to promote the exchanges and cooperation between Hong Kong and the UK. He said the purpose of this trip was to learn about UK Parliament’s rules of procedure, and actively introduce and publicize to all circles in the UK the sound operation of the “One Country Two Systems” policy in Hong Kong since its return to China.